Ever wondered how you could stuff a little more cheese into a grilled cheese sandwich? 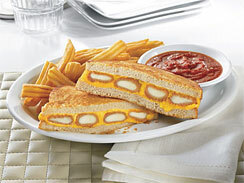 Wonder no more – Denny’s has done it. The answer: Deep-fried mozzarella cheese sticks smothered in American cheese and grilled between two slices of sourdough bread. Sound like a good time? The cost to your diet is 895 calories and 34 grams of fat. This entry was written by Chaos, posted on October 20, 2010 at 3:12 pm, filed under Random and tagged american cheese, buttermilk pancakes, deep fried chicken, denny, diet busting, fried mozzarella, grilled cheese sandwich. Bookmark the permalink. Follow any comments here with the RSS feed for this post. Post a comment or leave a trackback: Trackback URL.